The Blackhawks jumped on the Coyotes with a furious first period, and weathered a second period rush to emerge with a 5-2 victory to close out a fantastic road trip. The Blackhawks won the final six games of their seven-game road trip, allowing only ten goals in those six wins. Antti Raanta picked up his second win of the trip on Saturday night, making 30 saves. With the Blackhawks spending most of the second period short-handed, Phoenix put 17 shots on net in the middle frame but were only able to beat Raanta twice. He was perfect in the first and third periods. Patrick Kane opened the scoring, tipping a Marian Hossa shot past Mike Smith for a power play goal at 2:34 into the first period; the score came while the Blackhawks had a two-man advantage. Andrew Shaw slipped a puck through traffic and into the back of the net at 9:18, and less than two minutes later Niklas Hjalmarsson made it 3-0 Blackhawks. The Hawks put 16 shots on net in the first period, and carried the action for almost the full 20 minutes. But four second period penalties – two of which were against Hjalmarsson – provided chances for Phoenix. Martin Hanzal scored during the first of Hjalmarsson’s penalties to draw Phoenix to within one. When Johnny Oduya joined Hjalmarsson in the box, the Coyotes had more than 90 seconds with a two-man advantage of their own. But the Blackhawks were able to kill off the penalty and maintain their lead. Brandon Bollig added his third of the season half-way through the third, and Marian Hossa added an empty-net goal in the closing moment to close the scoring. Duncan Keith had assists on two of the first period goals, while Kane had an assist on Hjalmarsson’s goal. Brent Seabrook also had two assists in the game, giving the Hawks four players with a two-point performance. Jonathan Toews, Ben Smith, Marcus Kruger and Michal Handzus also had assists in the victory. Seabrook added five hits and two blocked shots to his two assists, and was much better with the puck than he was in Dallas on Friday evening. Hjalmarsson and Kruger led the Blackhawks with three blocked shots each. Both teams were 1-5 on the power play for the game, but the Blackhawks’ numbers benefited from killing only 1.6 seconds of an Andrew Shaw double-minor at the end of the game. The Hawks finally return to the United Center on Tuesday night. The main thing for me after this game is that Q should now be sure he has a capable backup to CC and there is no need to ride Corey to the brink during the regular season. He can not be afraid to use AR from here on. Not sayin we are Jennings repeaters, just spread it around between the 2 and we should be ok. I had to miss the game due to family stuff so I can’t comment on the game other than what I’ve seen on replay, but from the comments here and on other boards, it sounds like they had an outstanding 60 minute gam e, which was a departure from the previous games when they looked out of sorts. Smith and 16 played well again. 52 too! If Saad ever really develops a shot (or just shoots) – to go with all of his other Qualities-the kid will be scary good. Handzus- played his best game of the year-perhaps? 23/37/65- Hawks’s least effective line. Really nice to see the Hawks Play Controlled game(s)- and limit Grade A scoring chances. The BAD- commentators after game SUGGESTED that Khabby will get another CHANCE when he gets back from injury!!!! ARE U ****ing kidding!!!??? I got to the TV about 3 minutes into the second. Hawks looked like they could use a rest. But as in all sports the cream usually rises to the top. I thought Bollig had his best game of the season. His minutes (and goal) in the third period were good to see. I still would like to see Morin and Bollig alternate, but again Bollig played well. I think Hammers 2 penalties were simply fatigue as much as anything else. Both teams got away with an awful lot of physical play. Seabrook got away with a big crosscheck then almost got both wrists broken in retaliation. I have been and still am a big Smith fan. He belongs. His game gets better every week. I think he has seen the last of taking buses to games. @wall, say it aint so!! Seriously? hearing things about Khabby returning?, the WORST!! The issue is CLOSED as far as I am concerned. AR is the guy. Over and settled. Do we now have to defiantly wish bulin’s injury is a career ending one? I hate to be that calloused. I must eat some crow now & admit I was wrong about 88. Or rather he “proved” me wrong. His game has come a long way in 2 short years. He seems to have matured which I give him credit for. He has always been an elite offensive talent, he has now added a defensive component to his game. He’s made numerous plays back checking which is making him a more complete player. He still dogs it from time to time, but now it’s from fatigue for either being double shifted or staying too long on a shift. I hope he continues to develope his defensive abilities….. 19 & now 88 wow!!! Nice one JoeyZ. Takes a man….. I know you addressed Tab, just hope you werent thinking my PK words were dogging anyone in particular about his star status . (If u even read em) I just remember the sometimes heated debate on him, not the blog participants! I ‘ll bet JS recalls tho!! Memory like an elephant, despite the excessive ‘intake’. j/k JS, you top notch here bro!! You know that! 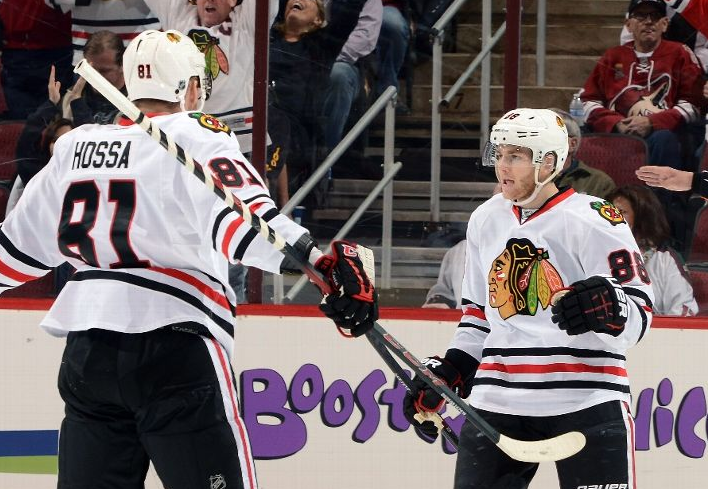 While Hawks fans watched some boring games on this trip, the results were outstanding. This team finds ways to win even when they aren’t playing consistently great hockey. The pattern seemed to be that they have have one bad period, but put together 2 solids. Third periods seemed to be where they found the will to win. I am not sure how many games they trailed on the circus trip, but I believe at least 3 games demanded a third period comeback. I would be curious how many it was? Never mind the number of comebacks, but the fact that they found ways to win those tight games is huge. This group doesn’t like to lose. Period! I tend to keep up with NHL results and stats via tsn.ca online and on tv with NHL Network. One thing I have noticed on NHL Network is the Hawks are flying under the radar. We keep hearing about how great St. Louis and San Jose are. Same with Colorado. While I respect these teams Cups aren’t won Oct-Dec. Considering the low amount of down time the Hawks had over the summer to get bodies healed and rested the early this team has been tough to beat. There have been some stinkers along with way, but it should be expected given the schedule and number of games that get played. 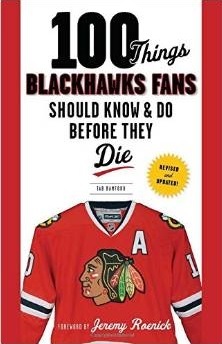 More important is fact that every team that plays the Hawks right now is jacked up to beat them. They have answered the bell almost every game and come away with positive results. I am pleasantly surprised with how well the Hawks have started out the year. The monster in the closet remains injuries. Hawks have been very fortunate so far. Strength and conditioning coach deserves some kudo’s. I like the talent mix on this team as long as we can stay healthy. One just hopes we get to playoffs healthy and then let the horses run. It is always interesting in hockey to watch how certain teams that don’t match up well on paper end up playing tough. Hawks have trouble with Calgary, Oilers, Ave’s, sometimes Phx. I see this as a result of those teams throwing a pesky forecheck that results in turnovers. If they shut down neutral zone via trap and stand up at blue line it becomes a dump and chase game, which is what other teams want us to do. Actually, this is what St Louis does as well so lets not forget them either. Raanta was just fine against Dallas. He did what was needed. My last comment about the Dallas game goes to Antoine Roussel. This cheap shot dirt bag basically engages in attempt to injure plays every game. While I haven’t paid much attention to the fight cards lately, his tendency was always to sucker punch guys and use his head that was protected with a long visor to get in close. Remember what he did to Seabs last year? His shot to Patrick Kane’s head the other night was classic Roussel. It was a direct attempt to injure Kaner. Some day this guy will get his. The thing with Roussel is this guy can skate and appears to have some talent. Reminds me of Raffi Torres, although Roussel does not have that notoriety yet.